American troops look out toward the border with Turkey from a small outpost near the town of Manbij, northern Syria, Feb. 7, 2018. Secretary of Defense Jim Mattis said the U.S. is not trying to get involved in the yearslong Syrian civil war, after U.S.-led coalition airstrikes killed about 100 pro-government forces who had attacked coalition-backed Syrian Democratic Forces. “It was self-defense. Obviously, we are not getting engaged in the Syrian civil war,” Mattis said. In this Feb. 7, 2018, photo, Defense Secretary Jim Mattis speaks during the daily news briefing at the White House, in Washington. 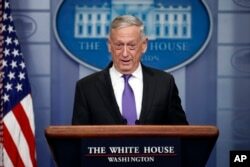 Some 300 pro-government forces attacked an SDF headquarters near Deir el-Zour, Syria, Wednesday but retreated after the U.S.-led coalition knocked out their artillery and two of their tanks, Mattis said. “I believe that they are, right now, west of the river,” he said, referring to the Euphrates River that has served as a so-called “deconfliction” border between Russian-backed Syrian government forces and U.S.-backed SDF fighting to rid the country of Islamic State fighters. U.S. personnel have been advising and assisting the SDF, and some were embedded with them at the time of the attack in Deir el-Zour province. No Americans were hurt, but one SDF member was wounded in the assault, officials said. FILE - Democratic Sen. Tim Kaine, center, speaks to reporters on Capitol Hill in Washington, April 7, 2017. U.S. Sen. Tim Kaine, a member of the Senate Foreign Relations and Armed Services Committees, criticized the U.S. strikes. 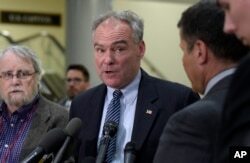 “While I am grateful that no U.S. or coalition members were harmed in the attack, I am gravely concerned that the Trump administration is purposefully stumbling into a broader conflict, without a vote of Congress or clear objectives,” Kaine said. U.S. military officials said the coalition was in contact with Russia before, during and after Wednesday's attack and had alerted Russia to the presence of SDF forces in that area. Mattis said the Russians had told American military officials that they did not have any Russian forces there. He called the attack a “perplexing situation,” adding that he could not give “any explanation for why” the pro-government forces would attack a well-established SDF headquarters. Pro-government forces had used Russian-designed T-55 and T-72 tanks to shoot at the SDF, Lt. Col. Earl Brown, a spokesman for U.S. Central Command, told VOA. 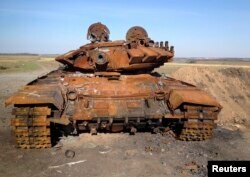 A destroyed Russian-made T-72 tank is seen on a battlefield near separatist-controlled Starobesheve, eastern Ukraine, Oct. 2, 2014. White added that all pro-government vehicles and personnel who turned around and headed west were not targeted during the coalition strikes. The attack appeared to be an attempt by pro-government fighters to take control of areas the SDF recaptured from Islamic State militants in September, the officials said. Syrian state media said the coalition airstrikes hit tribal fighters who were battling Islamic State and SDF forces. The reports called the strikes an “aggression” and said they killed dozens of people. U.S. forces began airstrikes in Syria in September 2014 after IS militants had swept into control of large areas in the eastern part of the country as well as northern and western Iraq. A year later, Russia joined the fighting in support of Syrian President Bashar al-Assad’s government. Russia and the United States frequently communicate to prevent each other from accidentally attacking one another’s troops. “The fact that somebody chose to attack us, and the Russians are saying, ‘’It’s not us,’ and we are firing on them to stop the artillery fire, that, to me, is not a failure of the deconfliction line,” Mattis explained.